A glut of performers, a dangerous density of music, an embarrassment of riches. 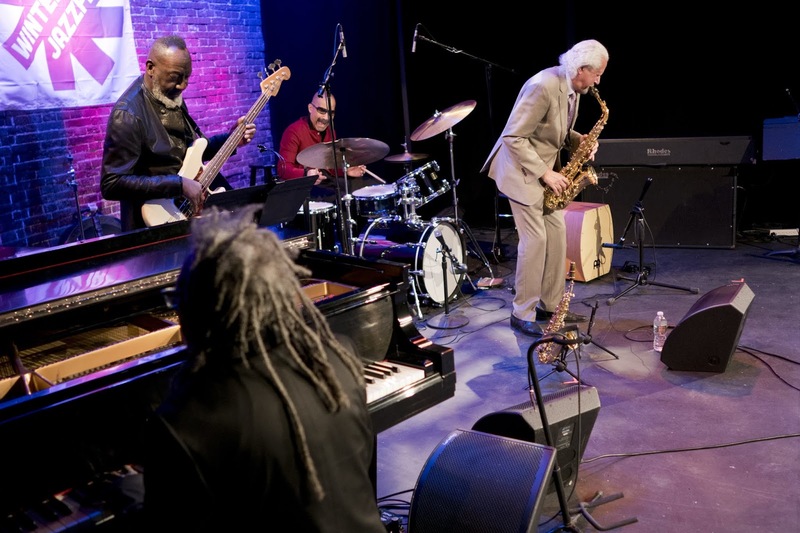 This is the impression Winter Jazzfest 2019 gives: a nine-day club-based jazz festival strung across twelve venues in Greenwich Village and Noho. The Marathon Weekend – the closing Friday and Saturday of the festival – is the musical climax. 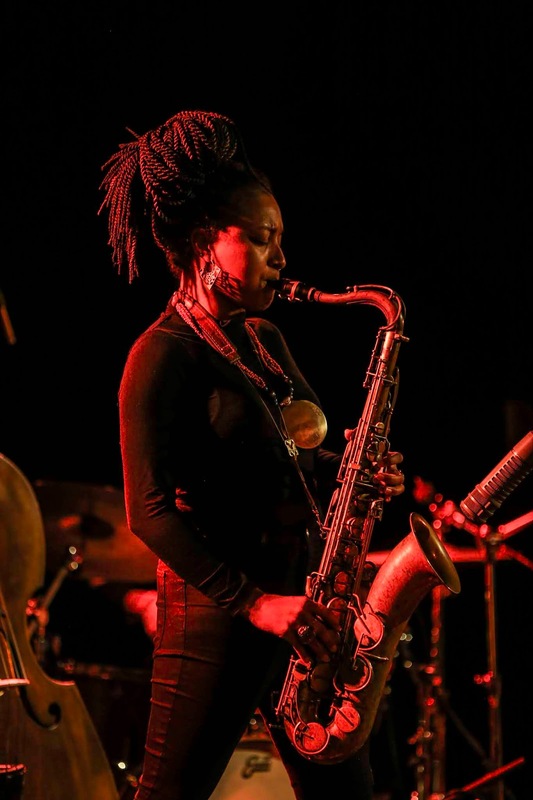 Under this one festival umbrella sat a diverse cohort of venues, each with its own distinct culture, atmosphere, and musical language, but united under a common jazzfest rulebook where the wave of a wristband let you cross all borders. Some venues showcased subgenres (like Hot Jazz), others hosted out-of-towner take-overs (from Chicago, or Paris), and some simply held birthday parties celebrating institutional milestones (for WBGO radio, ECM records, or even for 15 years of the Winter Jazzfest itself). 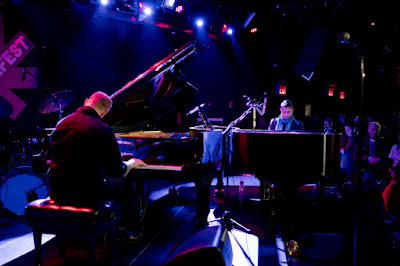 We start at (Le) Poisson Rouge, home-base for Winter Jazzfest’s Founder/Producer Brice Rosenbloom. Having kindly handed over the reins to the visiting Brits earlier in the week (see PRSF/BBC night review) the venue was celebrating 50 years of ECM records during the Marathon. A historic basement spot with an unusual dangling caged aquarium (Damien Hirst lite) welcoming guests on entry, it’s a comfortably spacious venue, but with a large corner stage also feels at once intimate. 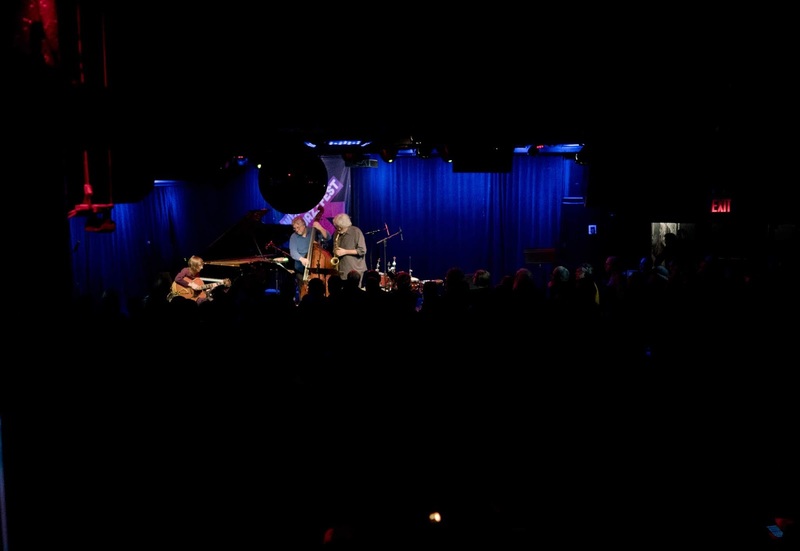 Michael Formanek’s Very Practical Trio, with Tim Berne and Mary Halvorson were practically huddled at the very front of the stage, too – three players in unison. Rumbling along, the similarity in register used between the strings of Formanek’s double bass and Halvorson’s guitar is interesting, even when it switches to a bowed bass and sharply plucked guitar. Berne’s alto sax soars almost like a violin at moments, with a flexible slip between notes. Not a deep sound, but a lament, before he readies himself for an endless solo stretch. They’re very closely aligned, switching from alto shredding madness with frenzied bass in hot pursuit, to unhurried, laconically sections of picked at notes. Between phases they just roll over, happily. Vijay Iyer & Craig Taborn took a more head-to-head approach. More literally in fact, with two pianos nestling on stage and the pianists facing each other. A more theatrical piece, they play to the crowd, silently rising and swapping instruments in a composed dance. Both virtuosos, they take turns with one as lead, one as rhythm, although occasional frissons of interest when both fight for the front, or both chop a rhythm. Their most successful moments do come when one sits back and develops a repetitive move, and the other lifts from it, playing as supporting individuals instead of jostling for shared space. A packed house is hushed, entranced. SOB was a less cerebral vibe, and instead embraced its Brazilian roots in hosting a dance party for 40 years of WBGO, New York’s jazz public radio. It’s all fenced-off dance areas and raised viewing terraces, giving different vantage points of the double height space pierced by occasional meaty columns and exposed column heads holding up the modest 11 stories above. Nubya Garcia also graced the stage, with a band full of double bass bounce from Dan Casimir (who plays it like it’s an electric, almost) and Garcia’s deep tenor tone. It sounds like she’s found an adoring crowd in NY, excited by the prospect of When we are, and Source. There’s a lot of high energy stuff mixed in, and a groove is never far away, with Garcia, like everyone else, finding it irresistible not to build a sound from a Joe Armon-Jones solo. The venue is less kind to them than the bearpit of LPR, with harsher acoustics and a confusing array of low-resolution screens live streaming the event from a soulless above-centre shot, giving it the feeling of being '80s archive footage from a cavernous empty venue. The Bitter End drops the ceiling down to normal in a brick-lined space packed with folk in a serpentine route between the bar and stage. The walls are lined with LPs from live recordings, and a charmingly laughable mural of famous folk (I think, not straightforward to recognise) behind the bar. There are people everywhere, to the point that you wonder what a capacity limit ticket on the wall is really for. They’re all here for a French Quarter evening on the Friday night, a takeover by Paris Jazz Club as part of their week in New York and Montréal. Baptiste Trotignon and Yosvany Terry’s ‘Ancestral Memories’ have headed their tour with some time in Boston before they then head off to Cuba for the Havana jazz festival. Formed around a keys and saxophones axis. It swings between great funky rocking bass and lazy keys ballads, the closeness of the space highlighted by the tangible feeling of air being sucked out of the room by every beat of the bass drum. The French residency switched to Zinc Bar for Saturday, but on Friday it was still American season, with Borderlands Trio, a piano format featuring Eric McPherson’s delicate drumming. Perhaps in an effort to avoid the overcrowding of The Bitter End, Zinc adopted an approach which didn’t embrace the walk-in fluid nature of the chaotic marathon crowd – good seats were kept down front for the spenders, with a gaggle of gawkers penned off at the back up the steps by the bar, either in line for a table or loitering. It was more like being at the end of a periscope: you see some things, but sound doesn’t travel so well. Almost surreal seeing mallets and fingers pull strings but hearing very little noise come out between the cocktail shake or the dropped build it. Too esoteric for the barman, there were moments of clarity when Kris Davis’ piano clicked into gear, if you could hear them. By Saturday the riff-raff were made to queue out in the cold, instead. The main artery of the festival is Bleecker St, a pulse emanating out from LPR in the centre. But with what felt like some flexible use of scale, the festival main map stretched out to the Bowery Ballroom in, well, Bowery (there were further venue outliers in the East Village also, where the edge of the world and the sea monsters should be). A little off the beaten festival track, this big nouveau theatre-style space with flanking balconies and opulent downstairs bar was staging some big events. Like the battle for equal professional tennis prize payments, it was announced that a real effort had gone into ensuring a gender balance of performers where possible. The two headline names on act The Music of Brooklyn were balanced, with Meshel Ndegeocello and Jeff Parker on bass and vocals, joined by a range of guests flitting on and off stage throughout. In trying to represent a borough as diverse as Brooklyn, they were dragged all over, from rapping over beats and cool muted trumpet, to slow rock with a heavy atmosphere, finally arriving at Jeff Parker earnestly providing a Barbra Streisand rendition. Subculture was the press hub, handing out wristbands and programmes in a large featureless hall while a crowd was ushered down into the bowels of the basement, seemingly an extension of the subway station next door but decked out like a rather suave cocktail bar. Here Amirtha Kidambi leads Elder Ones, a quartet built around her straining vocals and an unsettling drone. Pulling no punches, Kidambi uses the group to transmit her thoughts direct to the crowd. The squeeze of her harmonium adds a grating intensity over a quivering, liquid percussion style from Max Jaffe. There is no subterfuge as she rails against colonial behaviour, class and caste structures, and the inequality of society (a crowd supping expensive cocktails and wearing high-investment jazz festival wristbands is implored to Eat the Rich) – the musical challenge perhaps reflecting a disconnect between content and crowd. The atmosphere in the Sheen Center was at once more celebratory. The strains of the Sisterhood of Swing leak through the door as the line stretches through the lobby out into the cold. The popularity was such all weekend. At least at the Sheen you can hear something while queuing, instead of waiting out in bitter cold. Once through the threshold you’re in an auditorium proper, a sit-down theatre with grand cultural plans (officially the Archbishop Fulton J Sheen Center for Thought and Culture, surprisingly not named after everyone’s favourite Welsh go-to Tony Blair actor Michael Sheen). John Gilbreath, DJ and executive producer of the Pacific Northwest’s Earshot Jazz promotion foundation is warmly welcomed by a crowd, and warmly welcomes Pocket Science, an all-star band billed to unite progress and tradition. They start off very much in the tradition camp, Gary Bartz leading a line of clean and leisurely solos, with everyone waiting their turn nicely. It feels this might be a way off from Bartz’s Thursday night exertions with Pharoah Sanders et al, re-living their 1968 avant effort Another Earth. But Pocket Science aren’t here to stick to genres – percussionist Kahil El Zabar begins to plumb different traditions with unmiked primal wails and thumbing out a melancholy slow jam. Robert Irving III reaches into the belly of his piano with one hand, the other on the keys, for a more different call and response. We’re taken through funkier Dreamscapes by Jamaladeen Tacuma, before El Zabar picks up a wooden flute, and recites an ode to Joseph Jarman (poet, spiritual leader, musician). In fact Pocket Science are at their most enthralling when El Zabar leaves the drum kit behind, and the group refocus on a new format. A late addition to the festival venue selection, the Greenwich House Music School is a truly honest space – a world apart from subterranean cocktails or modern concert halls. Once you walk past the institutional school cork boards and notices, on the open top floor of an old row house is a school stage in front of a set of fold-out chairs. A tired wood floor sits beneath more chandeliers than seem customary in such close proximity. Pacing around the venue wearing a turtleneck, shades and a corduroy blazer, delighted and occasionally shouting ‘whoopah’, is Michael Katsobashvili, organiser of the NY Hot Jazz Festival, which celebrates its fifth anniversary. And this is a space, an idiosyncratic musical subgenre community, where everyone knows everyone, and there’s a real joy in playing, listening and being together. The place oozes with old-time appreciation as Julien Labro plays a blisteringly fast accordion, a baffling blur on a button board which looks almost alien compared to the rest of the festival's instrumental zoo, but so neatly controlled. Frankly it is the least glamorous-looking instrument, but the band are so tight and accomplished any image is irrelevant. Joined by Olli Soikkeli at the front of the stage this is really evocative gypsy jazz, rooted firmly in an interwar Paris scene, of small clubs and dusty hill towns. There are some more unexpected moments, too – a home-sy version of On the Road Again, a Zorn-dedicated piece with a pulsing accordion buzz when it’s rhythmically thumped by Labro, but overall just a real joy of accomplishment, riding the changes, doing everything right. In amongst the choice, the variation, the place I was most drawn to was the SoHo Playhouse. Adam Schatz was curating the Search and Restore stage, and it was constant refreshingly new angles in an unpretentious den. Almost spiritual in its layout, a dingy narrow theatre with a glowing backdrop at the end, and nothing much else going on. When the lights are down people seep in at the back, like moths to the light mesmerised by the music and slotting into a tiny theatre chair where they can. Irreversible Entanglements channelled an intense chaos, Camae Ayewa (Moor Mother) constantly questioning and chastising with stretches of spoken word. Stephanie Richards played scent artist collaborations in coordinated formal horn structures, cycling through an array of mutes/pie dishes, next to Oscar Noriega and his alternating alto and rich bass clarinet. The most overwhelming, immersive 40 mins was spent with the genuinely astounding Subtle Degrees. Words, in fact any pauses, are unnecessary as Travis Laplante and Gerald Cleaver smashed barriers. Laplante’s lasting impression is not his tireless near-constant circular breathing, but in how he employs it to weave such thick, textured soundscapes. Snippets of melodies are sandwiched between running scales, a busy sound for three people not one; we have harmonic doubles, mutating drones, a permanently ringing bell, with no other tone and all chord changes and forms emanating from one tenor saxophone. 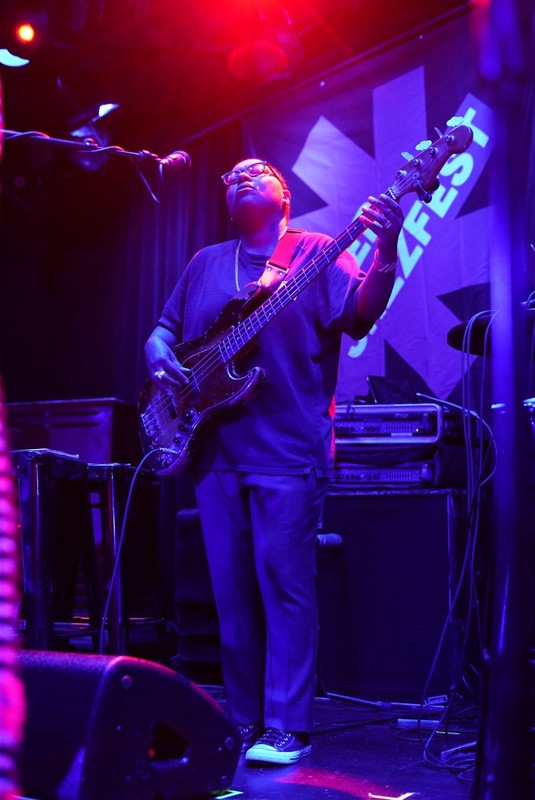 But he’s charged up by Cleaver, who ebbs and flows, and grows and moves through the pieces – crashing, snapping, dropping to a bass beat, a life support, finely composed and tied to the developments in Laporte’s stage of the piece through nods signals and the occasional expansive instrumental wave. This is how a saxophone can be played, this is how drums can be played, this is a wall of sound. It’s not necessarily always subtle, but it’s unbelievably exciting. 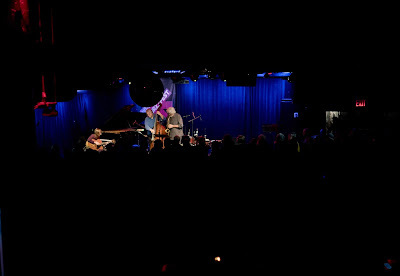 Staged in the beating heart of New York’s jazz clubs in Greenwich Village, I naively thought the Winter Jazzfest would simply be a convenient window into the NY scene; it was more like opening the floodgates. It’ll take months to follow up on what I saw, but more importantly, it’ll take years to follow up on the vast majority that I did not.